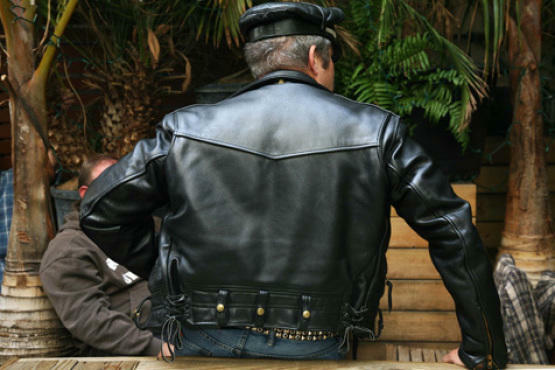 This Saturday's leather-bear festivities were certainly not what was originally planned. But even if promoter and bear-about-town Robert Valin didn't get to fill a downtown street with scantily clad, burly men, a good time was still had by all who attended the scaled-down Leather + Bear Beer Bust & Barbecue at the Delancey Lounge. We swung by the party where we spotted as-featured-in-TONY folks including Mr. Valin, Khane Kutzwell (who offered shaving services; we only saw heads getting buzzed, but all body parts were fair game) and Williamsburg bear Philipp. Also in attendance was friendly Project Runway alum Stella Zotis, who was selling and auctioning off cool original leather gear. Shoe shiner Brandon was raising funds to head out to a bootblacking competition (evidently, that exists!) in San Francisco. Complimentary cigars, burgers and hot dogs kept the guests full and the air smoky. While the daylight hour probably kept this from turning into the sort of raunchy party one might expect of an event with the words leather and bear in the title, there's something undeniably endearing about seeing creatures of the night hanging out in the late-afternoon sun. Check out our slide show above for pics of the revelry!